What is it about the Diavel that has made every bike lover, every critic, every Ducati hater (if anyone exist) go weak on their knees when they see the Diavel? 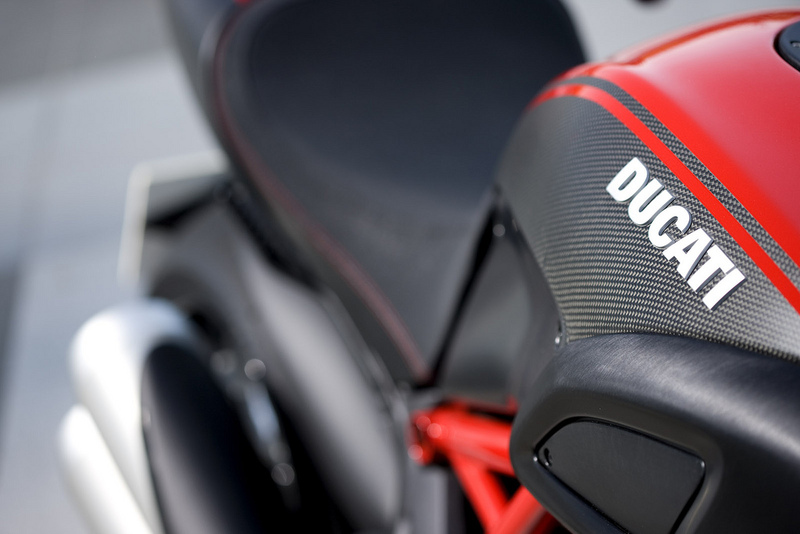 We all know Ducatis are exotic yet the common man can aspire of owning one. There are (by now) many high end bike manufacturers who make limited edition bike at exorbitantly high prices that are well beyond the common man’s reach. 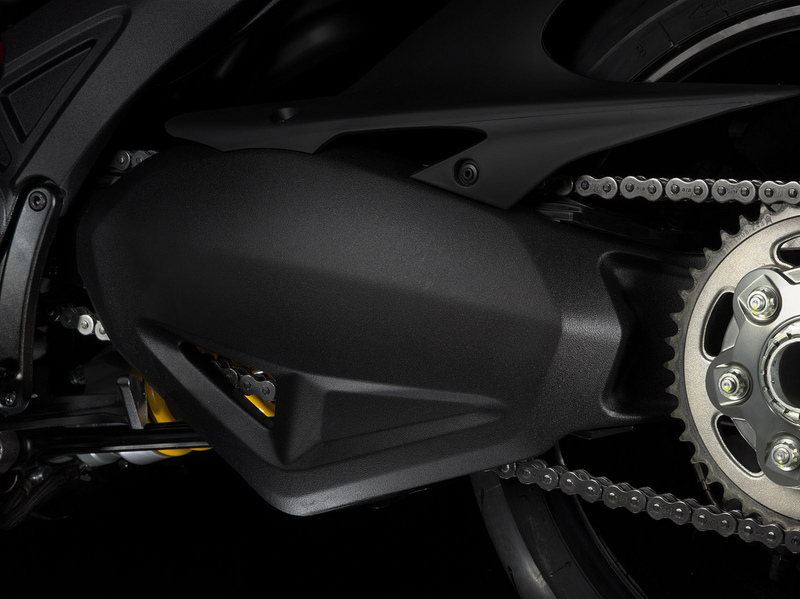 These bikes appeal to specific fan bases and these machines do provide well-crafted engines. This is where I believe Ducati scores heavily. 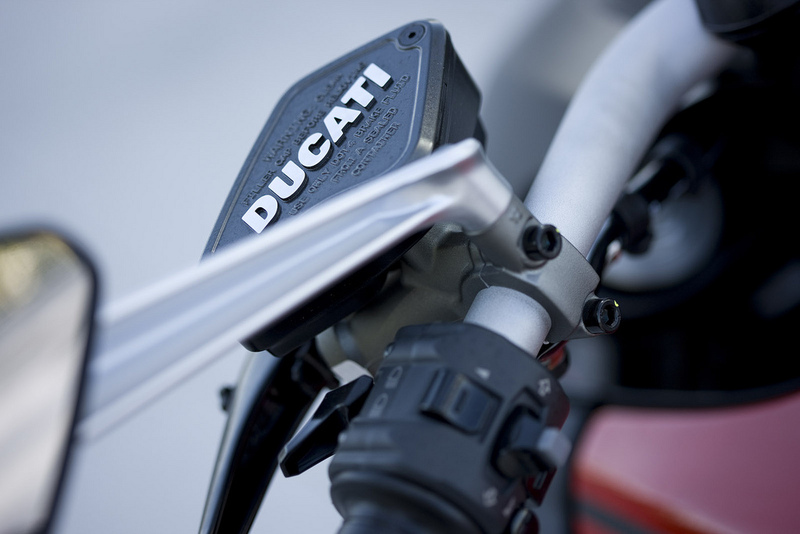 The Ducati products are so good looking that individually, each model is like a custom bike, but they are not. We don’t even need to think how well their engines perform. And the best part is that the ‘fan base’ we are talking about cut across all ‘bases’, all ‘styles’, all ages and of course it has the heritage and legend of the Ducati brand. 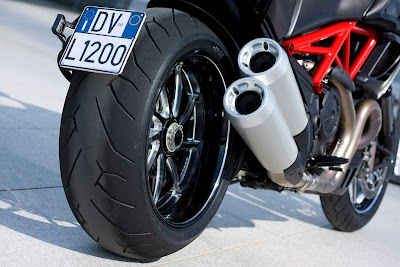 The company which started out worldwide with their lip smacking 900 series of sports bike ventured out to the naked bike series with the Monster brand. The Monster became a benchmark in naked style bikes with their exposed trellis frame. Then there is the Street Fighter, the bike which won many accolades in terms of designing. Although there were many critics who didn’t like the bike’s overall styling and personally I think it was too edgy, but once you see it in flesh, you tend to love it. 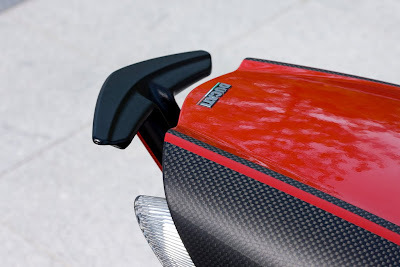 During all these time, there were plans that Ducati is working on a cruiser and again people were skeptical how well can Ducati pull off a cruiser since it is a Ducati, it has to be different, but then how can a cruiser look different? Well, so now we have the Diavel, a bike so smashingly good looking that cruiser lovers are calling from roof tops that Ducati has finally heard their yells, but even street riders are voicing the same thoughts. 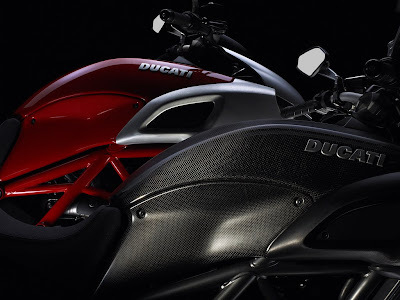 It is now as if a lot of ‘fan bases’ are calling the Diavel to the ‘the’ product of their category. But fact is, this is a Ducati and it cuts all categories. Yes, it is probably a cruiser gene somewhere, but how can you miss the distinctive ‘street’ appeal? Or is it a Power Cruiser like the V Max? Lots and lots of critics are comparing the Diavel to the V Max, in fact comparisons have started long before its official launch. 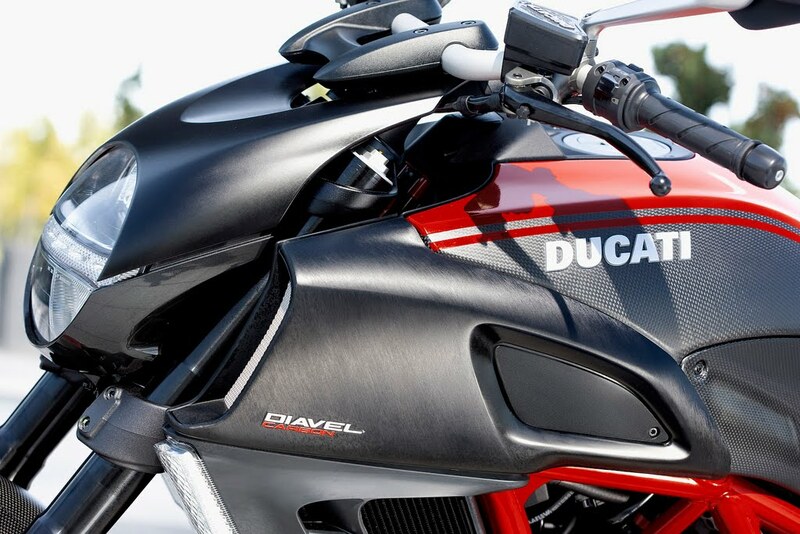 So that is the thing, the Diavel is a Ducati. Period. That is the category it belongs to. 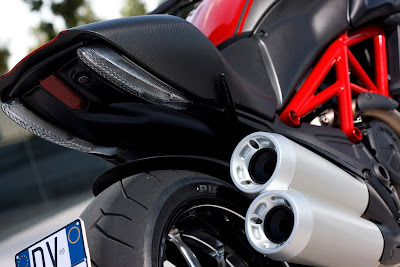 You know, no matter how hard you are a cruiser fan, you just can’t ignore the 918, no matter how much you love SBKs, you just can’t ignore the Monster and likewise no matter which fan you are, you just can’t ignore the Diavel. And it won’t be wrong say that the bike will run away with lots of ‘Bike of the Year’ awards and probably a lot of ‘Bike of the Decade’ awards too. 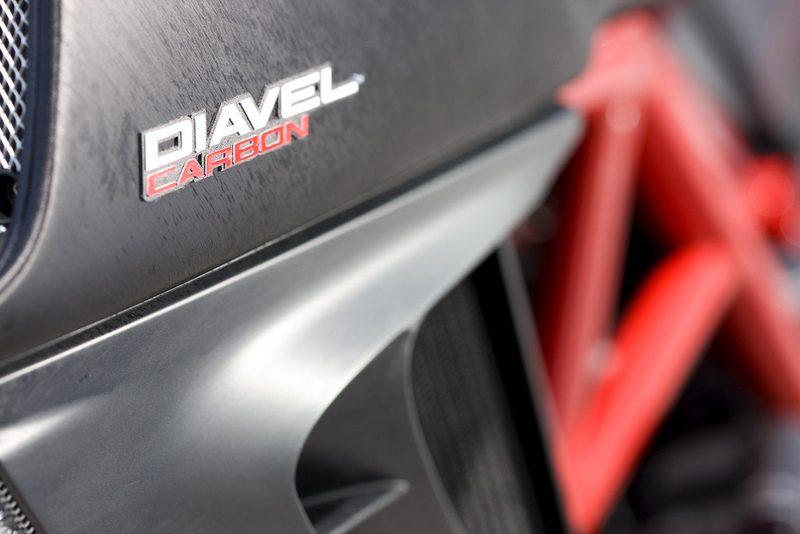 The idea of the name Diavel - pronounced Dee-ah-vel, was born early in the development process when a factory man saw it and remarked that the bike looks like a Devil. In Bolognese dialect, of course Diavel is what you would say for Devil. And remove the D from Devil and Evil is what you get… from the bike. Lots of fans would probably get evil to own The Diavel while many rival companies must be calling Ducati evil as it will sway quite a few customers to the Ducati side. Just as the ‘Monster’ is one of the favorite Ducati for both its affordability and easy handling, the Diavel is surely going to be the flavor of cruiser lover, power bike lovers, street bike lover, naked bike lovers and of course, how can you not associate Ducati with performance, so it will jolly well find a lot of erstwhile sports bike fans. But this is not a Power Cruiser bike in the mould of V Max and the B King. For one thing, the engine is not on the wrong side of 1500cc, it is actually the same 1198cc engine and secondly, it is not big as you think it is, certainly not of monstrous proportions like the V Max or even the V Rod. It is quite small having dimensions of 1192mm x 2257mm. Its dry weight just about touches 200 kilos which means it is a lightweight, add to that its agility and so now, what do you say, is it a sports tourer or a naked street sports bike? It all gets very confusing so the best thing is to let it be just the ‘Diavel’. But if you think that with these specifications, it will not have a commanding presence, boy, you are so damn wrong. Commanding presence, it has… and HOW! You cannot miss a Diavel even in the Rio Carnival. 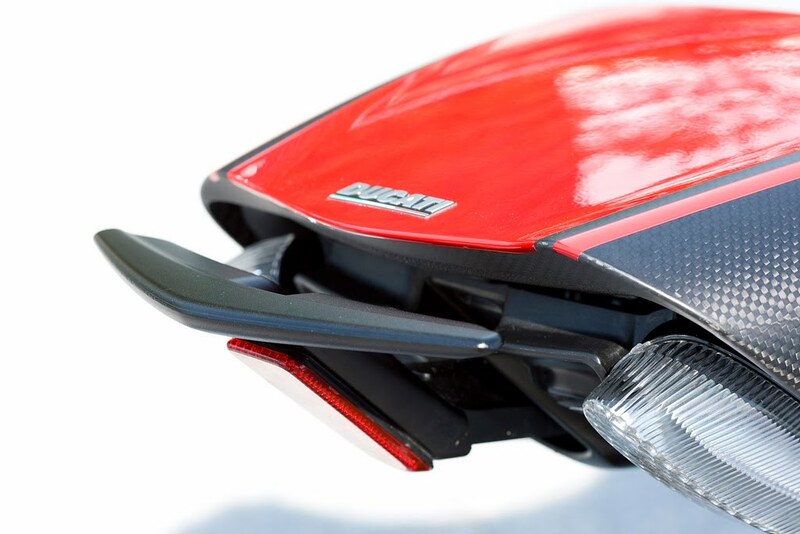 Just to remind you, it is built by Ducati. Some critic has mentioned that Ducati should concentrate on what it does best, that is make ultra luxurious sports bike, s/he mentioned that how will it feel if Ferrari comes out with 4 door cars? 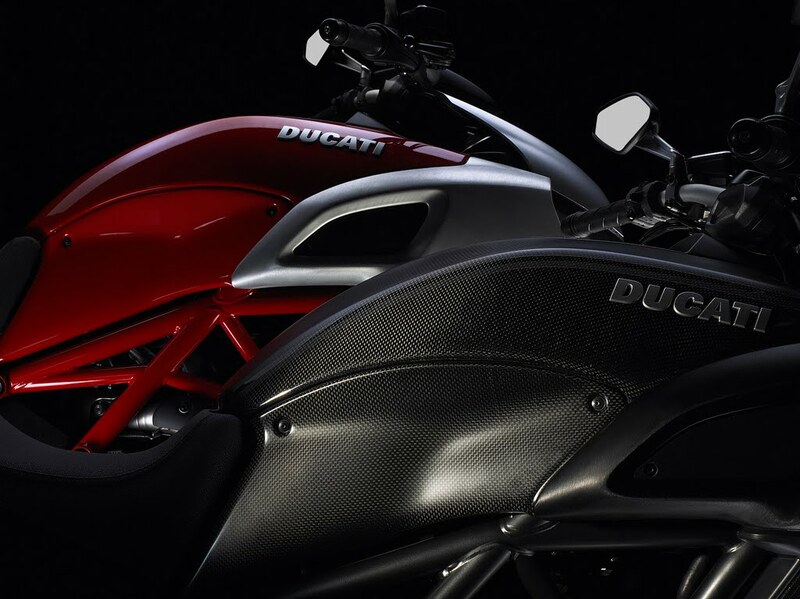 Point well taken, but then think anout it, if Ducati didn’t give us the Diavel, we would have no Diavel. Let me repeat, if Ducati didn’t make the Diavel, we would have no Diavel, what I am trying to say is that only Ducati could have made a Diavel. The styling, the portfolio, although a criser bike, yells out as a Ducati. For cruiser lovers wanting to have a Ducati logo embedded in between his/her legs, Diavel is his/her bike. Why leave out any market when you know you have a desired and wanting customers? I get what the critic is saying, you want a 4 door luxury car, look at Bentley, look at Rolls Royce, likewise, if you want a cruiser, look at HD, V-Max, B-King, but I think although you can compare a Rolls to a Bentley, you just cannot compare the V-Max to a Diavel. I cannot explain why, but to make sense, let me reinstate that Diavel makes a complete new category, power cruiser road steet king! Dycati rightfully mentions that the Diavel is a combination of custom shop beauty with state of the art technology, innovative design to provide extraordinary riding pleasure. 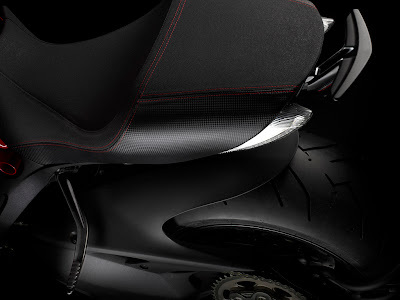 For connoisseurs of technology, ABS, Ducati Traction Control and Ducati Riding Modes will deliver a confidence-inspiring sophistication while stunning looks, the Superbike-derived Testastretta 11° engine and 207kg (456lb) of authentic Ducati performance will drive a comfortable sport lifestyle that could only be dreamt of until now. 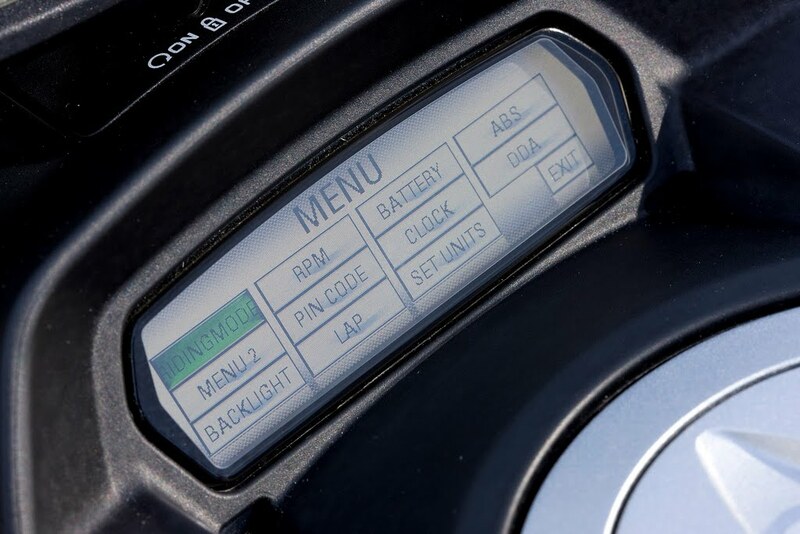 There is just so much more in the Diavel, for the techno buffs there is plenty to enjoy including Ride by wire throttle, ABS, hands free ignition and traction control. 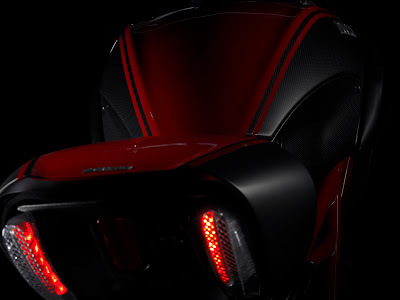 The new model will be available as a base model in traditional red or pearl white whilst the Diavel Carbon which includes carbon bodywork components and forged Marchesini rims and is available in red carbon or black carbon. 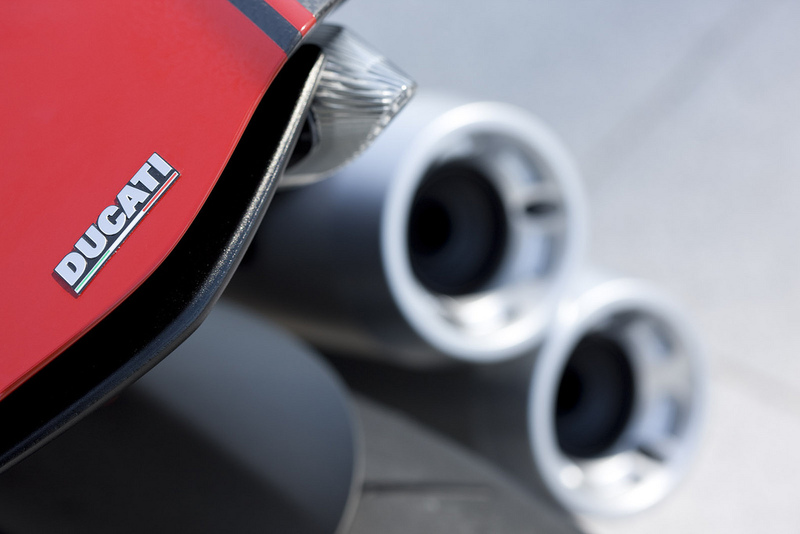 With 162bhp on tap and weighing 456lb (207kg), the Diavel is sure to win the performance king of its class. 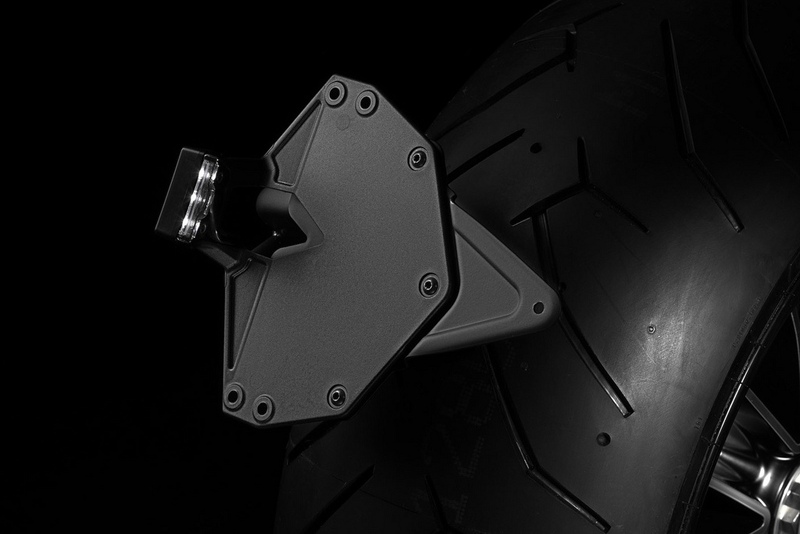 The specially designed 240mm rear wheel on a massive 8″ wide rim provides the requisite custom presence. 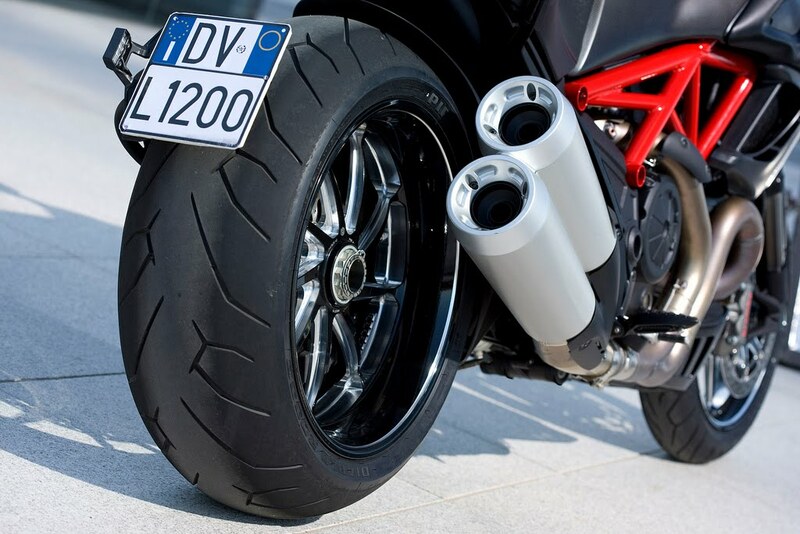 50mm fork is by Marzocchi, fully adjustable shocks by Sachs 240/45-17 rear tyre for cruising, wrapped around 14-spoke alloy forged Marchesini wheel with a bunch of carbon-fiber goodies, the Diavel is out to make a statement. Radially mounted Brembo monoblock calipers on 320mm semi-floating front discs, state of the art Ducati Bosch-Brembo ABS system as original equipment, antilock brakes as standard, traction control, as mentioned, ride-by-wire throttle with three maps (162 hp sports-type delivery, 162 hp for touring and 100 hp for street), the Diavel has everything you can ask for. Pirelli has worked with the Diavel's designers and engineers to develop the new Diablo Rosso II tires, a conventional 120/70 x 17 section front designed for enhanced wet weather performance to go with the 240/45x17 rear custom-style rear. 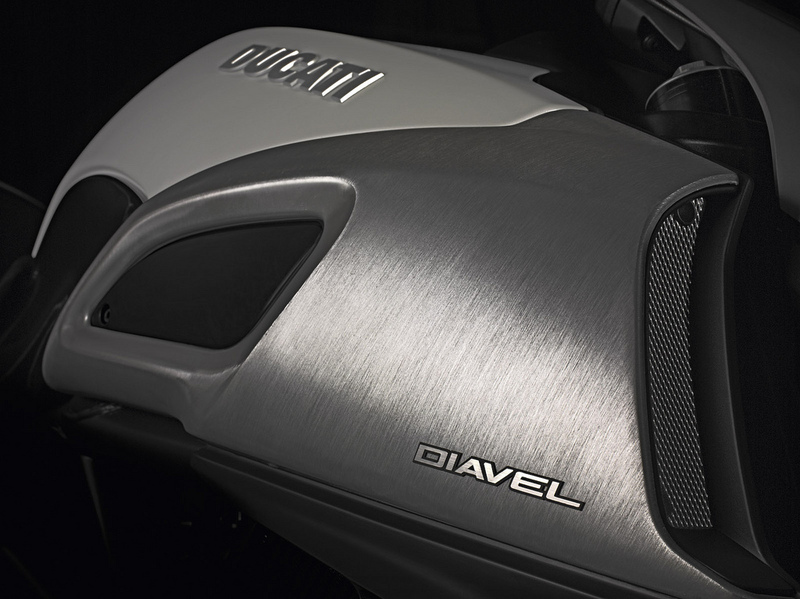 But since Diavel is out there primarily to woo the cruiser fans, it has all the ingredients of a cruiser. Exceptionally low seat height for a Ducati at just 30.3 inches, stretched out pegs and reasonably wide handle bars, the cruiser lover will feel at home. 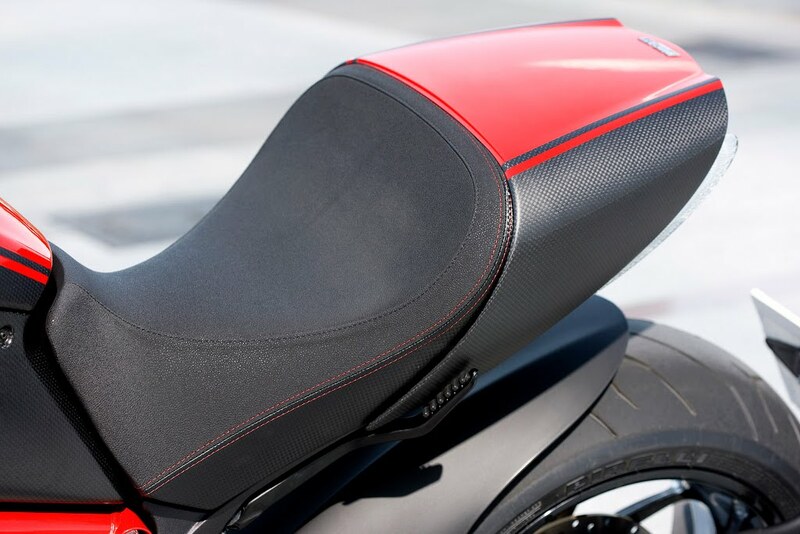 But just so, s/he wants to go the sports mode, just fold the passenger pegs and they hide completely, and get the piilion seat cover mount and lo! You have a sports bike. 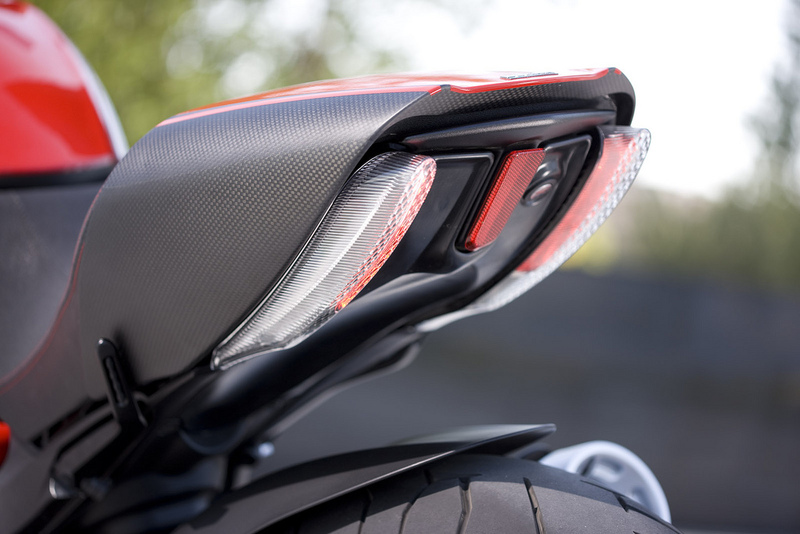 Behind the pillion seat, you can see the vertically stacked LED tail lights complimenting the front’s vertical LED turn signals mounted on the radiator shrouds. The headlight looks somewhat similar to the Monster, but with a more aggressive look, you know, kind of ‘I am ready’. And then the stylish license plate, it is bolted to the rear hub with a trellis frame wrapped around the rear tire from the left to hold the number plate in the area where the policeman would want it to be. 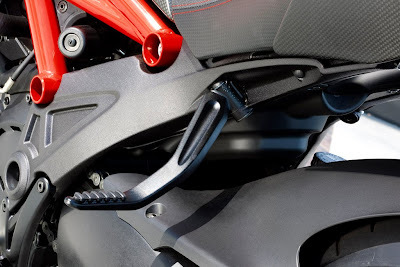 The Diavel, just like the latest Ducatis, is equipped with a hands-free ignition which means with the key in your pocket, the bike becomes armed as soon as you reach 6.5 feet within the diameter of the Diavel. So basically, the Diavel has everything any biker would fancy and if you are a biker, which I presume you are since you are reading this blog, sign a cheque of $16,995 or $19,995 for the base or carbon variant respectively and check it out in your nearest Ducati dealer. 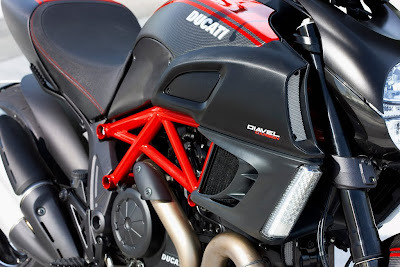 Let me assure you, you will not come out with the cheque, rather with a big smile on your face atop the most handsome devil you have seen till Ducati thinks about building a new Lucifer, Villain, Rogue, whatever since the monster and now the Diavel are already icons. 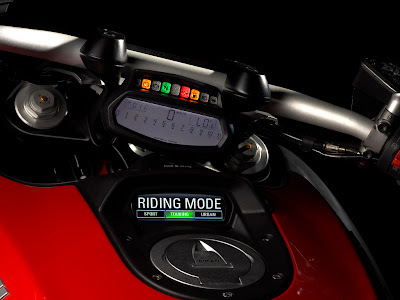 Instruments: Handlebar mounted instrumentation with LCD display: Speed, rpm, time, coolant temp. Warning lights for: Neutral, turn signals, high-beam, rev-limit, DTC intervention, ABS, status, oil pressure, fuel reserve. 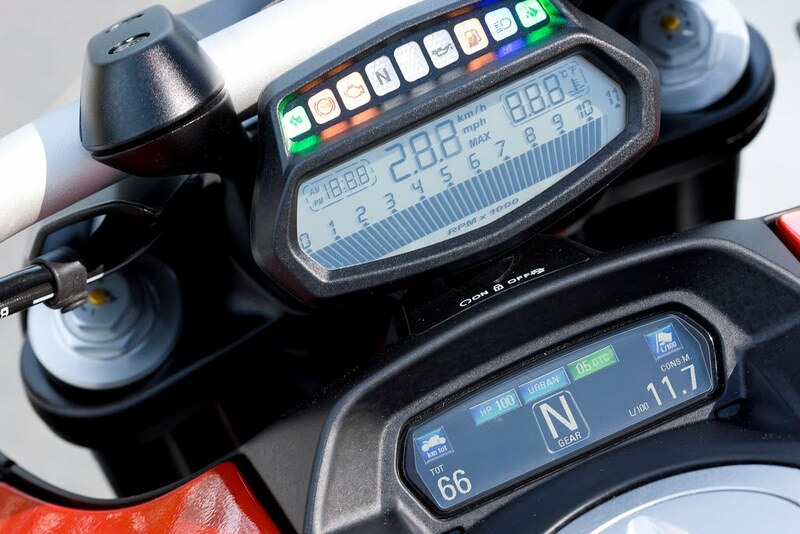 Tank mounted instrumentation with TFT colour display: Gear selected, air temp, battery voltage, trips 1 & 2, fuel, reserve trip, average and actual fuel consumption and speed, trip time, scheduled maintenance. Full status and/or management of Riding Modes, DTC, RbW and ABS. Transmission: 6 speed, Wet multiplate clutch with hydraulic control.